The narrative begins with Ashok Kumar’s negative role in Kismet as early as 1943, and goes up to the Agneepath remake (2012), where Sanjay Dutt plays Kancha Cheena, earlier essayed by Danny Denzongpa in the original. In between, it discusses all major villains from Lala Sukhiram (Mother India) to Gabbar (Sholay) to “Lion” Ajit (Kalicharan to Mogambo (Mr. India) and many others. While keeping villains in the focus, it also discusses popular henchmen and vamps like M.B. Shetty Sharat Saxena, Nadira, Bindu, Helen Bipasha Basu, among others, to understand the dimension of the villains’ empire. After all, it’s our villians who make our protagonist the hero we all admire. An engrossing read, this book is for every film buff. Tapan K. Ghosh is a former head of the Department of English, Rabindra Bharati University, Kolkata. On finishing his term, he turned to creative writing. His stories have since then been published in US and UK journals, one of them earning him a place among the top-10 stories in a competitive event held in England, and later published in the anthology The Bus Stop Scheherazode and Other Stories. His story, “Border,” found a place among the top-12 stories in Labyrinth Competition of London in February 2005. I am delighted to know that a full-length study on Bollywood villains has been attempted here, analyzing the frames in detail in which many of my worthy colleagues and myself appeared and mouthed the familiar lines over a long span of time. It is also a pleasure to see that even the henchmen who have added to the villains' empire and the vamps who contributed to the pride of villains have also been carefully studied in this book. In this connection I remember Kati Patang, where I played Kailash, the bad guy. Kailash was a member of the society, a man rather common but with dimensions; unlike some fictional characters, like Mogambo, for example. Even down the seventies I was once again the bad corrupt boss in Kala Patthar, taking advantage by following a divide-and-rule policy among workers. Gradually, the villains turned t to be so fascinating that the heroes started playing negative roles, possibly trying to understand how someone becomes a bad guy. This has been a noticeable feature in the development of villains in Bollywood cinema, something that has been looked into in this book, making many other insightful observations. I have been privileged to continue till now, and in this context I remember some of my colleagues who have departed from the scene. 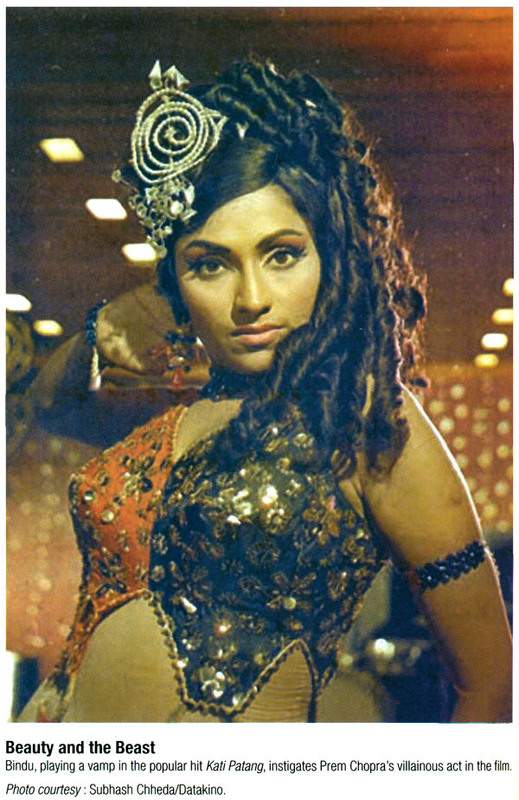 I was a college-mate of Amrish Puri, who was four years my senior. I love to think how these people would have been glad to see and read ok like this that has been dedicated to the baddies. In Dostana with Puri was my henchman, and it was great to share the stage with him. This too has been examined in this study. The web of our life is of a mingled yarn, good and ill together,” ore Shakespeare. True, beyond doubt. Human life justifies the experience, and Bollywood films have always shown this. Written in a witty and friendly style, this book recognizes this unique contribution made by Bollywood cinema. I recommend the book for the viewers and readers of all kinds, and wish it a success. However, the proposed film didn't take off due to this author's pressing academic engagement and other reasons. Possibly as compensation, I made a documentary-Under the Sky-in 1991, immediately after finishing my four-year term as a jury member on the Central Board of Film Certification. Events were happening pretty fast in the country. Political rivalries took precedence over national problems. The socio-political scenario was shadowed by a pall of gloom, like the early dawns in Parinda (1989), a Vidhu Vinod Chopra film. The film shows smuggling rivalry on a gruesome scale. Kabutar Khana, a well- known crossroads near Mumbai's Dadar railway station, unfailingly bawled out by bus conductors and used by pedestrians more than a hundred times a day, becomes a center of activity in Parinda. Prices of commodities soar as checkmating of politicians increases. A hungry boy watches the pigeons eating grains inside the sprawling net-wire at kabutarkhana that shows a murder later in the film. The suffocating dawns of Parinda suggested that days feared the strangling menace of nights, making the sun look pale and overpowered by a waning moon. Something in the rule of nature had gone wrong because of a complete reversal of values on earth. This was, then, the situation. 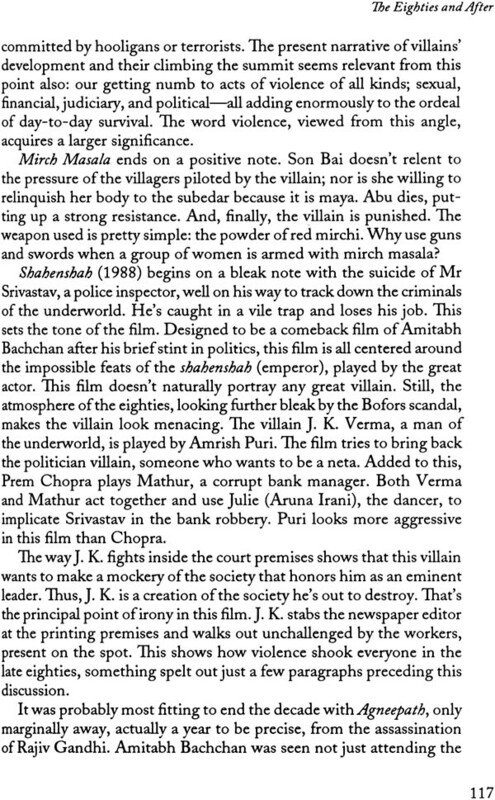 Deepa Gahlot, writing in 2001, says that “corrupt politicians, sadistic cops, remorseless rapists, gangsters, hitmen, extortionists-these villains proliferated in the 1990s, both in real life and in films. Mere citations cannot suggest the range of indebtedness to previous writers in the field. Articles occasionally wrote about Bollywood baddies and vamps in their own ways. At least, the subject has been on air since the turn of the century. This gave credence to what this author was thinking in the early nineties. 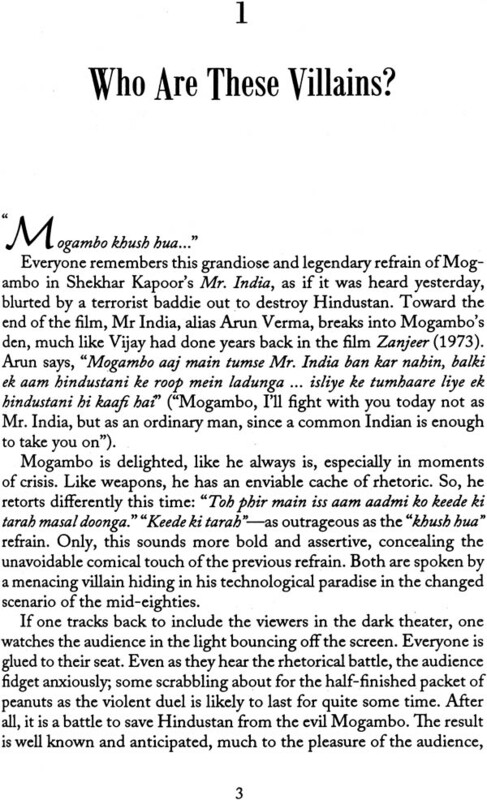 The present story of villains, henchmen, and vamps, along with some minor characters-the role of the editor, for example, in Mr. India (1987)-had to be a straight- forward account for the sake of popular readership, especially those who contributed over the decades to this unbelievable phenomenon of mega entertainment even in the context of world cinema. In that sense, this book can be considered to be as much a tribute to the villains as it is to these viewers, who unfailingly lined up for purchasing tickets from the booking counter in theater halls all over the country. They came out with their stomachs full, whistling the popular numbers, or singing the tunes, some still shaken by the awful baddies they had seen a while before. It has been a real bonanza, dear readers. This is why the notes provided at the end look a bit emaciated compared to some other books on cinema. The room on the table is filled up with delicious items made with the help of countless visuals, each studied from a different perspective. The subject, therefore, was considered important, and enough to capture popular imagination and readership, providing a two-and- a-half or full three-hour entertainment. Can the viewers of Kismet (1955), Do Bigha Zamin (1953), Mother India (1957), Jaal (1986), China Town (1974), An Evening in Paris (1967), Sholay (1975), Karma (1986), Karan Arjun (1995), Om Shanti Om (2007), Agneepath (2012), and so on be hooked again like they were in the theater halls in the form of written words in their drawing rooms, on trains, or on planes? After all, the great Bimal Roy, Mehboob Khan, S. Ali Raza, Sachin Bhowmik, Hrishikesh Mukherjee, Salim-Javed, and others of their ilk did it first on paper with written words. Any visual, after all, has its genesis in the mind. What if the films were taken into account from beginning to end, recreating the spectacle visually and imaginatively? The author got to the task, a daunting one, no doubt. While writing, it was found that the previous directorial effort on paper, however tentative and short-lived, yielded results, providing insights into the visuals; details, in particular. Not all grapes are sour. How is Pran walking into the frame in Madhumati (1958), or how does he return to his fold in Raj Kapoor's Jis Desh Mein Ganga Behti Hai (1960)? What is M. B. Shetty doing on the deck of the ship in Night in London (1967)? What is the ever-boisterous Tun Tun doing in Kishore Sahu's Dil Apna Aur Preet Parai (1960) or down the valley in Bluff Master (1963)? What does Sharat Saxena's funny way of crawling up to his trusted hunter mean in Mr. India? Who is the bitterly anguished schoolteacher in Nishant (1975) aiming at when he throws a stone in the air? How does the wicked subedar in Mirch Masala (1987) chase Son Bai or what does the priest in the crowd assembled at the masala factory say? Why does Anupam Kher, another versatile actor of Bollywood cinema, adjust his spectacles in Karma? These and such others turned out to be the questions for the sake of pure entertainment, for understanding the villain's mode of operation and yes, for enlightenment too. This scintillating Bollywood show, remember, has a subtext in it-a film within a film-shooting off a layer of suggestions. This is why the actors essaying villains in Hindi cinema have been given a separate treatment in this book. If Hamlet, in Shakespeare's famous play, felt that the world was “out of joint,” and that he'd catch the conscience of the murderous king by staging a play within the play, enacting the events, then it might also be profitable to look at Bollywood baddies from a fresh perspective to catch the conscience of our heroes, who have always hogged the headlines of newspapers in this land of hero worship. This could remind one of how the country, still plagued by scam and corruption, was progressing under political leadership in the seventies, eighties, and nineties. This generation of movie-goers may not know much about the social-political scenario of the past and many actors and actresses of bygone days. Needless to say, this kind of a viewer's approach to Bollywood baddies began not to prove anything. The films are already there, along with brilliant fringe works. But, during work, a whole lot of possibilities emerged, making one aware that these things do indeed add to the entertainment package. This is possibly another glitzy aspect of Bollywood cinema, maybe cinema in general. Kancha's father in Agneepath (2012), for example, is shoved off down the stairs. He's an addition to this film's awesome show, like the other additions. 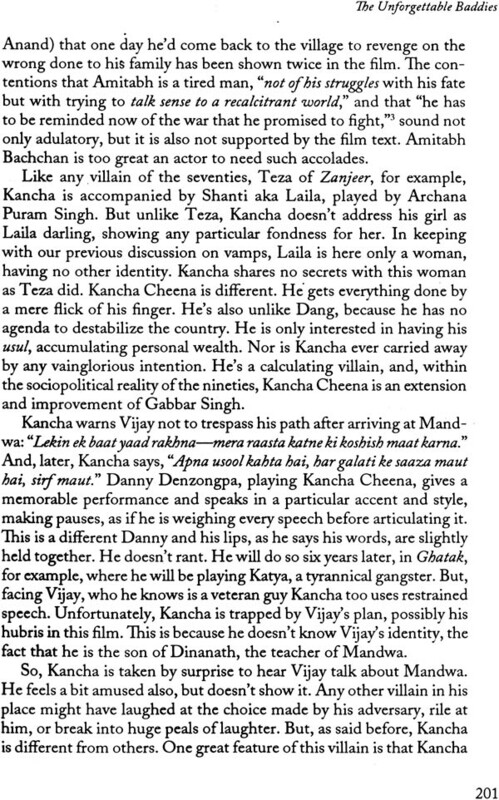 But, this one adds to Kancha's uncompromising and over-the-top villainy shown in the film. Mithun fans might have been irked to hear before the release of the film that the character of Krishnan Iyer MA of the 1990 film was done away with in the new version. The end product, however, shows that the filmmaker was justified. We have discussed this in the book. It was rewarding, for example, to note that the villains were a bit unjustifiably intimidated by the rebirth impasse of heroes and heroines right through the fifties till the present century. Look a likes, giving them at least 30 confused seconds before they have the faintest idea about what's going on, have kept the villains tantalizingly wary. But, they soon spring into action, solving the puzzle. This is in addition to the fact that the villains are on many occasions challenged by criminal heroes, some sentenced for life-term imprisonment. Finally, the villains are thrashed, biting the dust, according to the trend of the decade; though the heroes, facing a grim challenge, hardly ever snuff it. The fierce battle, raising uproar in the elements as it does in Agneepath (2012), leave everyone stunned, and they remain glued to their seats till the end or till the titles slide up on the screen. 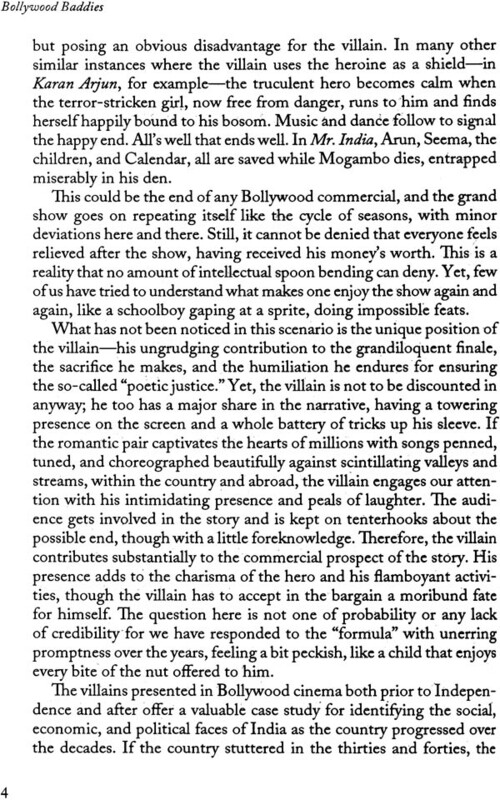 Villains are the unsung heroes of Bollywood cinema, just in case the notion of heroism is extended to imply everything that is both moral and immoral, virtue and vice spun together. What virtuous action, after all, was taken by the hero in Agneepath (2012) in wiping off Mazhar Lala, Rauf Lala's elder son, and later Shantaram? Of course, he had his agenda. Everyone has. The web of our life is like that of a mingled yarn, good and ill together-so wrote the Elizabethan bard. Right through the seventies and the decades that followed, the heroes became restless and wary in choosing their paths. The problem of making a choice mounted as the decades rolled on and as the overall scenario in the country went downhill. It wasn't a special feature of the mid-nineties alone. This should set us thinking differently about the so-called disappearance of the baddies in the last decade of the previous century. This, along with others, forms the subject of this narrative. Divided into three parts, this story of bad dies, their henchmen, and the vamps have been scripted to provide entertainment, just as Bollywood films have done over the decades. Can we “write good angel on the devil's horn?” That's possibly a good question to ask, philosophically and aesthetically, because it lies at the root of human experience on earth. It's time now to raise the curtain.